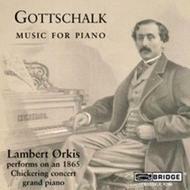 Recorded in 1982, this re-issue of Lambert Orkis’s program of Gottschalk piano works brings back to the catalogue one of the landmark recordings of the revival of interest in the great 19th century American composer/virtuoso. Orkis performs on an 1865 Chickering concert grand piano, an instrument similar to the Chickerings that Gottschalk employed on his American concert tours. Gottschalk was born in New Orleans in 1829, the first child of a large, well-to-do Jewish family. His family lived not far from Congo Square (now Louis Armstrong Park), where the music of Afro-Americans – music that would eventually evolve into jazz - was played. Gottschalk’s virtuoso compositions for piano made significant use of this music, combining it with forms developed in his studies and travels in Europe. Lambert Orkis has received international recognition as chamber musician, interpreter of contemporary music, and performer on period instruments. He has appeared world-wide in recital in North America, Europe, and Asia with violinist Anne-Sophie Mutter since 1988 and with cellist Mstislav Rostropovich since 1983, and continues to perform with The Castle Trio, a period instrument ensemble in residence at Washington’s Smithsonian Institution.